The "Karnaugh Map Method", also known as k-map method, is popularly used to simplify Boolean expressions. 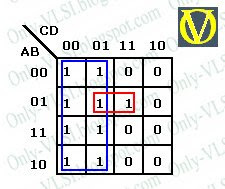 The map method is first proposed by Veitch and then modified by Karnaugh, hence it is also known as "Veitch Diagram". 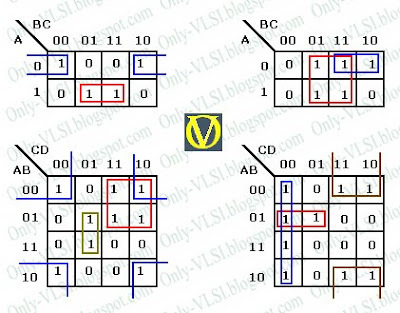 The map is a diagram made up of squares (equal to 2 power number of inputs/variables). Each square represents a minterm, hence any Boolean expression can be represented graphically using a k-map. The above diagram shows two (I), three (II) and four (III) variable k-maps. The number of squares is equal 2 power number of variables. Two adjacent squares will differ only by one variable. The numbers inside the squares are shown for understanding purpose only. 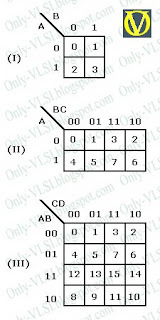 The number shown corresponds to a minterm in the the Boolean expression. Obtain the logic expression in canonical form. Identify all the minterms that produce an output of logic level 1 and place 1 in appropriate k-map cell/square. All others cells must contain a 0. Every square containing 1 must be considered at least once. A square containing 1 can be included in as many groups as desired. There can be isolated 1's, i.e. which cannot be included in any group. A group must be as large as possible. The number of squares in a group must be a power of 2 i.e. 2, 4, 8, ... so on. The map is considered to be folded or spherical, therefore squares at the end of a row or column are treated as adjacent squares. The simplest Boolean expression contains minimum number of literals in any one in sum of products or products of sum. The simplest form obtained is not necessarily unique as grouping can be made in different ways. The following diagram illustrates the valid grouping k-map method. The above method gives a simplified expression in Sum of Products form. With slight modification to the above method, we can get the simplified expression in Product of Sums form. Group adjacent 0's instead of 1's, which gives us the complement of the function i.e. F'. The complement of obtained F' gives us the required expression F, which is done using the DeMorgan's theorem. See Example-2 below for better understanding. 1. Simplify F(A, B, C) = Σ (0, 2, 4, 5, 6). 2. Simplify F(A, B, C) = Σ (0, 2, 4, 5, 6) into Product of Sums.